The Birth Tree Project celebrates the arrival of each newborn and newly-adopted child in the Williston community by offering a tree to the family to plant on their property. The 2017 celebration was cancelled, so we will hold a joint 2017/2018 celebration Sunday, September 30, 2018, at Gardener’s Supply in Williston. 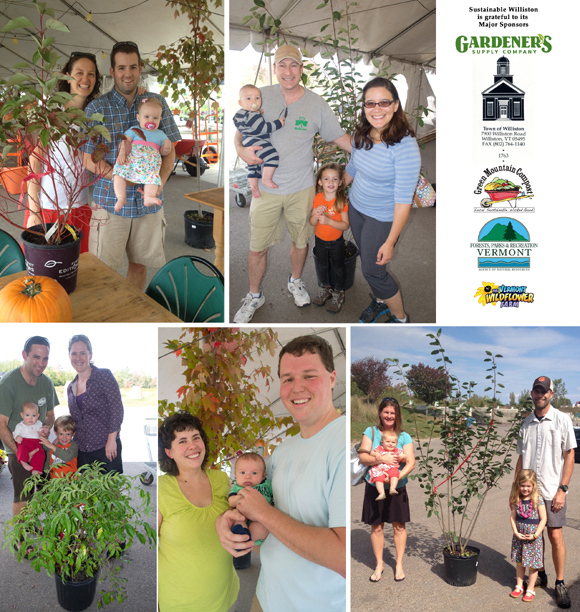 Families who register by early September 8th, 2018 for the program will receive their free trees and shrubs, and enjoy activities including crafts and food treats. All Williston Residents are invited to attend the celebration. If your child was born/adopted after July 31st, you should register now for the fall 2019 celebration. We believe that inviting families to plant native trees on their property will instill a sense of community pride, have positive impact on wildlife, and contribute to a cleaner and better environment for all residents. Taking the responsibility to help the tree grow and provide tender loving care is an example of good stewardship that supports sustainability in the community. It offers today’s children as well as future generations a place to live and grown in harmony with nature. We would like this project to be part of Williston’s culture and heritage. Children born or adopted into Williston families between August 2016 and August 2018 are eligible for the 2017/2018 Birth Tree Project: you can register here. Children born or adopted between August 2018 and August 2019 will be eligible for the 2019 event and can also register here. The Birth Tree Project is run by Sustainable Williston with the generous support of Gardener’s Supply, and the Town of Williston. Registered the other day but didn’t receive an email confirmation. How can I check to make sure registration was accepted? Hi Angela. Just checked, and you’re all set! Same question? Registered a while ago, no confirmation. All set? I became a great-grandmother of 2 in 2016. I live in Williston, but the new babies do not. Do I qualify?